It’s not often that I go to an organ recital in which I come across music I have never heard before and which I would move heaven and earth to hear again. Such a thing has never, ever happened to me in Singapore before. Here, the organ community lives and breathes North German Baroque and French Symphonic Romantics to the exclusion of all else – and often in blissful ignorance of the inappropriateness of such repertory to the organs at their disposal. 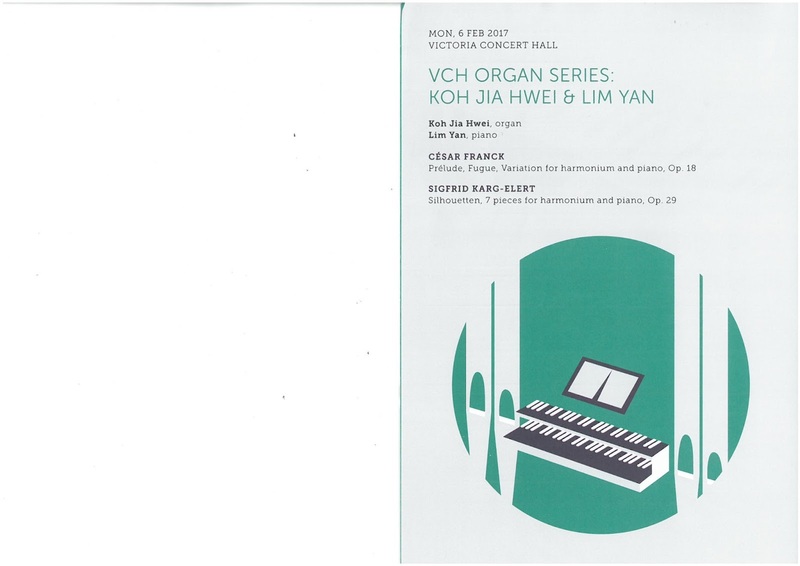 I am a huge supporter of the Victoria Concert Hall Organ Series simply because it is the only organ series in Singapore. But my loyalty has often been sorely tested by some pretty inidfferent performances of some pretty uninspiring repertory. And I have to say that the VCH Klais is a horrible instrument and one which is virtually impossible to play without a cohort of assistants to pull in and push out stops, often with hefty accompanying clunks. That these assistants so often spend most of the recital dancing around the organ console, squeezed frighteningly close to a precipitous drop down to stage, is yet another reason I find recitals there so off-putting; I wish that, just once in a while, we could have someone choosing a programme which they can play unaided and yet which suits the limitations of the Klais; but such a day has yet to come. Nevertheless the monthly recitals are something I make a point of attending, and will often persuade the Straits Times to run a review; the idea being that it draws attention to an aspect of Singapore’s musical life which often gets overlooked by the musical snobs who believe that the only concerts worth going to feature famous pianists playing Liszt and Chopin or superannuated conductors directing Mahler and Rachmaninov. I am not alone; the organ series consistently attracts a very sizeable audience, and while some might cynically suggest that the audience is there because the concerts are free or because they preface a public tour of the concert hall, I offer full credit to Margaret Chen, who masterminds the programme along with VCH’s own Michelle Yeo. They have identified a demand for relaxed, lunchtime concerts and filled it by promoting organ music to the point where there is a clear appetite for it; whether the music is good or bad or the playing brilliant or indifferent. Concerts featuring an organ and piano duo are extremely rare. The sheer physical and sonic size of most concert hall organs means that, in a straight fight, the organ invariably delivers a knock-out blow in the first round. However the Klais organ of the Victoria Concert Hall is relatively small while the Steinway piano is pretty big and, with a bit of help from some inspired programming and two skilful players, this was a more equitably matched affair. 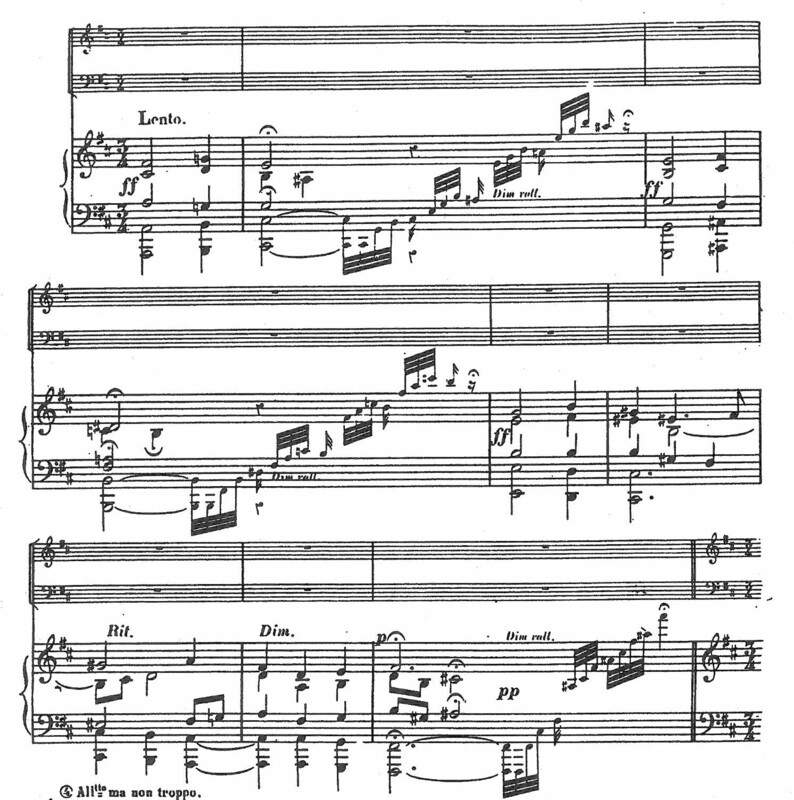 An unavoidable consequence of pairing off these two instruments is a slight conflict in tuning, and with the organ perceptibly sliding out of tune as the concert progressed, by the time we reached the encore – Elgar’s Salut d’Amour – the relationship had soured somewhat. Tuning issues were not an issue in the actual programme, however, not because they did not exist but because the music itself was so captivating. 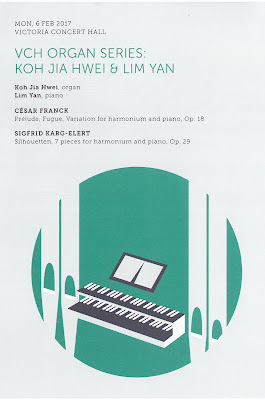 On top of that, organist Koh Jia Hwei and pianist Lim Yan played it all with such compelling artistry, that only the most astute ears might have picked up small discrepancies in pitch. 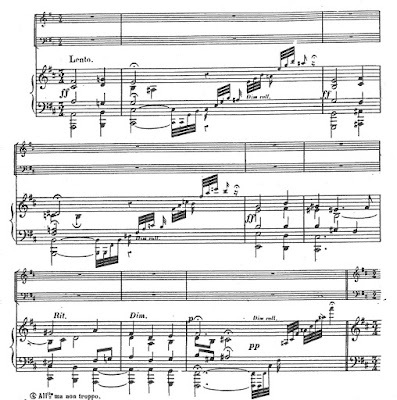 Avoiding music specifically written for organ and piano – not a problem, since there’s hardly any of it – they chose two substantial works scored for piano and harmonium, the organ’s very much smaller and more intimate relation. 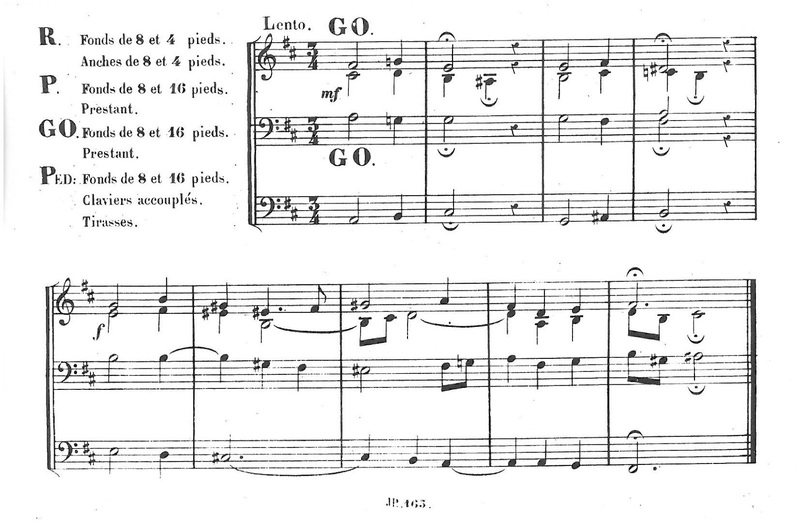 Cesar Franck’s Prelude, Fugue and Variation is a mainstay of the organ repertory, but here it was presented in an arrangement for the two instruments by Franck himself. He had taken the opportunity to throw in a handful of pianistic arpeggios which Lim polished off with great aplomb (smothered, unfortunately, by some ill-timed applause) but otherwise the arrangement left the organ delicately to pick out the endearing theme on a variety of stops while the piano provided the harmonic meat. A complete novelty was Sigfrid Karg-Elert’s Silhouetten. 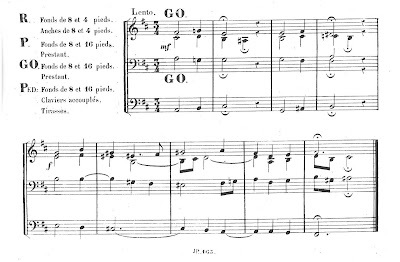 This was specifically written for harmonium and piano, so hardly ever gets a public airing. And that is to everyone’s loss, for it comprises seven totally beguiling pieces. Full of colour, character and charm, each one is strongly reminiscent of Grieg, but longer and more ingeniously constructed than anything he wrote. 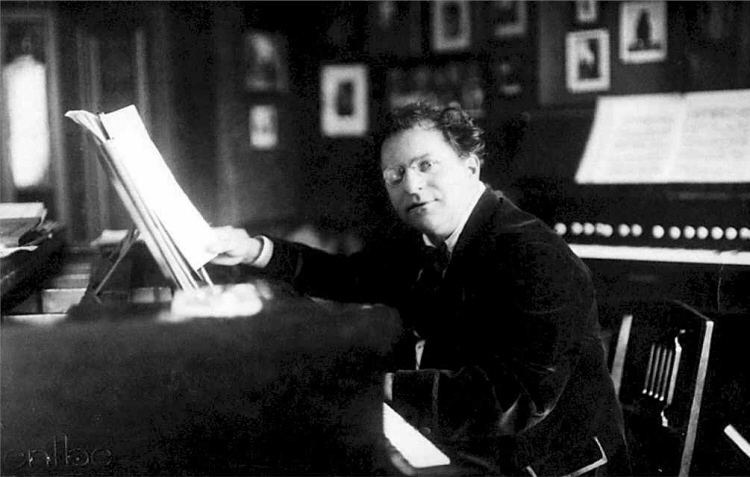 Those who know Karg-Elert’s style would have been surprised by the music’s freshness and its uncomplicated harmonic language. Being a husband-and-wife team, Koh and Lim have an innate understanding of what each is doing, and the result was a wonderfully fluid performance. Ever sensitive to the issues of balance, Lim took on an almost orchestral persona as he weaved around Koh’s beautifully poised organ playing. Not to be outdone, Koh’s assistant also weaved around, busily manipulating the organ stops and flicking pages backwards and forwards with great alacrity. She even took a bow and enthusiastically applauded the joint performance. It was mildly irritating, but did not detract from a concert which was both inspiring and utterly delightful.